Last month we were delighted with our first project from EEME where Elliott built a Project Genius Light. The kid was excited when the next box came in. Once again, this little brown box contains everything you need for an exploration into the world of electronics and engineering. The second project from EEME is a DIY Display, and I'm happy to share another review with you. 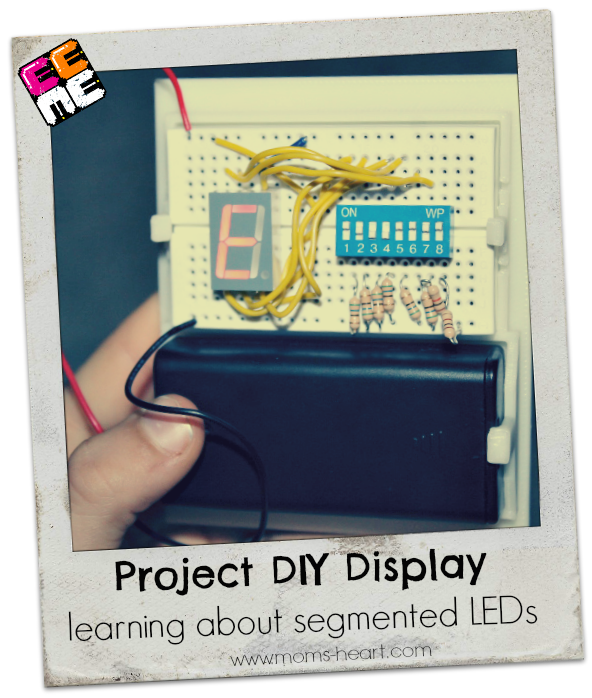 According to EEME, this is what we had in store for us: "In the second project, your kid will wire up an LED display to a switch system, learning about segmented LEDs and switches along the way." My kid is all about antiques right now, so he was thrilled when he found out he would be building something from "the past" since it was described as before the times of the iPad and touch screens, which is basically all his generation has known. I really appreciated that one of the first videos was a very basic review of the breadboard and how it works. Elliott remembered most of the information we reviewed, but I love that it was built right into the course. I also still love the periodic reviews where the student answers multiple choice questions or summarizes what they learn. Sometimes I just have Elliott answer to me rather than try to type his answers out for the summaries, but I can also type as he dictates. Last time we sat at the kitchen table with my laptop, but this time I had the forethought to cast the browser to the television, so we could watch the video course more comfortably! The videos are also still simple and clean. I think it's important that there's no background noises or visual distractions within the video. The short videos allow a lot of information to be covered in bite-sized pieces. One video may have Elliott building something, the next video will be an explanation of what they just did, and the next video might have him take it apart and do something different to demonstrate why things work (or don't work) a certain way. I love how the course allows for this exploration of the topic being discussed. It's not just a step-by-step guide to building something fun. It really is teaching him along the way. Each video is clearly labeled and there were diagrams along the way for where to place the pieces, should you need a better visual. Some of the things covered in this project were how a segmented LED is controlled, shared resisters, what would happen if we used a stronger resister, and how to use the switch panel. At the end, Elliott was encouraged to basically play around with it to create different configurations with the LED lights. Of course he had to make an E for Elliott, and he played around to make different letters and numbers. I will say that last month we worked through the project in two sittings and that worked well, but this time we worked through it all at once. It took us about two hours (with some interruptions) to get through the 38 sub-lessons, and that was too long for him. Older kids could probably get through it faster or not get as fidgety over the course of two hours, but that's a long time for my 8 year old. I definitely think for the younger end of the age range, that breaking it up into two sessions is perfect. I still can't say enough great things about this EEME course. You get everything you physically need in a small box each month, and all you do is login to access the very detailed videos. We are using these as part of our homeschool, but they would work for summer projects or after school learning too. They are the real deal, and I'm in love. More than that, my kid loves it, and is learning so much without even realizing it! For kids that are highly interested in electronics or engineering this is a great gift. You should also have them check out the EEME Blog for interesting articles and videos. There's a lot of great information there! They have different purchase options, but I am using the $18.95/month for the basic subscription. You can find more information on the EEME website, or follow them on Facebook, Pinterest, Instagram, or Twitter. Special Note: If you sign up through my referral link, you will receive $10 off your first month, OR you can buy the Builder Basic 6 Project Set (through this specific link) for a bundle of the first six sets shipped together. No wait time between projects! That would make a great summer activity that promotes learning but doesn't seem "schoolish" at all! Please remember I only share products we genuinely enjoy and recommend.